Haidong Gumdo is one of the fastest growing martial arts in the world right now, and has quickly become the second most popular martial art in Korea. Haidong Gumdo – Minnesota is now offering a Master Instructor Certification to help Master Instructors from other Korean martial arts quickly launch Haidong Gumdo programs in their schools. HDGD Midwest schools have been certified by the World Haidong Gumdo Federation (WHGF) in Korea to offer a program and bring this martial art to your school. If you are a Master or School Owner in Taekwondo, Tang So Do, Hapkido, Kumdo, Hwarang Do, Kuk Sool Won or another Korean based martial art, we have a program to help you earn your 4th Dan certification and mentor you in bringing a Haidong Gumdo program to your school. Haidong Gumdo is a new sword based martial art. Much like Taekwondo, it was formed 30 years ago as a way of bringing historical Korean sword arts back to life, while invigorating them with new material and training methods. World Haidong Gumdo Federation president Kim Jeong Ho learned the arts that became Haidong Gumdo through instruction by Grand Master Jang Baek San about 50 years ago. Grand Master Kim had received his initial training in Kumdo, or Korean Kendo (the Japanese sword art/sport) but Grand Master Kim had felt that the art was too Japanese, and focused on one-on-one sparring. He left the leadership of the Korean Kumdo Association to form his own art. Like all Korean martial arts, historical sword arts were aggressively purged from Korea following the Japanese occupation of Korea from the early part of the 20th century to the end of World War II. Kendo (pronounced Kumdo in Korean) was forced on all who sought sword training. Grand Master Kim, Jeong Ho sought out training in the hidden historical Korean sword arts to help bring them to light much like had occurred with Taekwondo empty hand techniques based on Takkyon. To address the shortfalls with Kumdo, Grand Master Kim, Jeong Ho created Haidong Gumdo to be based on techniques for war and one warrior against many others, rather than the 1 on 1 dueling combat seen in Kumdo/Kendo. There are a multitude of historical Korean sword arts that Grand Master Kim, Jeong Ho trained in, including Sang Su Do (two handed sword training) and others. These arts can all be found in the Muye Dobo Tongi, a manual of traditional Korean martial arts authored in 1798 by General Yi Duk Moo to preserve Korean Martial Arts history. Other historical Korean sword arts include: Ssangsu (two handed sword), Ye Do (short sword), Je Dok Gum (Admirals Sword), Ssang Gum (two swords). Haidong Gumdo added these arts to it’s curriculum by creating a series of 7-12 forms based on each of them. These have become the official forms (Gum Bup) of Haidong Gumdo. Practitioners of Haidong Gumdo therefore learn the Ssangsu Gumbeob, Shimsang Gumbeob, Yedo Gumbeob, Bonkuk Gumbeob and others. Haidong Gumdo is a very complimentary program to empty hand Korean martial arts programs that will allow you to add new students to your school by offering them more choices. Most empty hand arts like Taekwondo have evolved to be attended mostly by children under the age of 18. While parents of students often think about joining, the number is small. What leading martial arts schools are finding is that Haidong Gumdo programs are very attractive to parents of martial arts students, and it allows martial arts schools to offer programs for the whole family. And, whole families that train together are much likely to stay involved in martial arts for longer. And last but not least, it offers a “coolness” factor that helps differentiate your school above other martial arts programs which, frankly, have all begun to blend together. The mythology of the sword and its role in history has captivated people for generations. The culture of the “samurai” swordsman has driven movies and literature for over 100 years in America. People love the concept, and like that of the western gunslinger, it is imprinted on our society as an ideal that many people want to emulate. The students who join view the art as a quest for personal perfection and are very aware that they likelihood that they will every use a sword for self defense is very low. 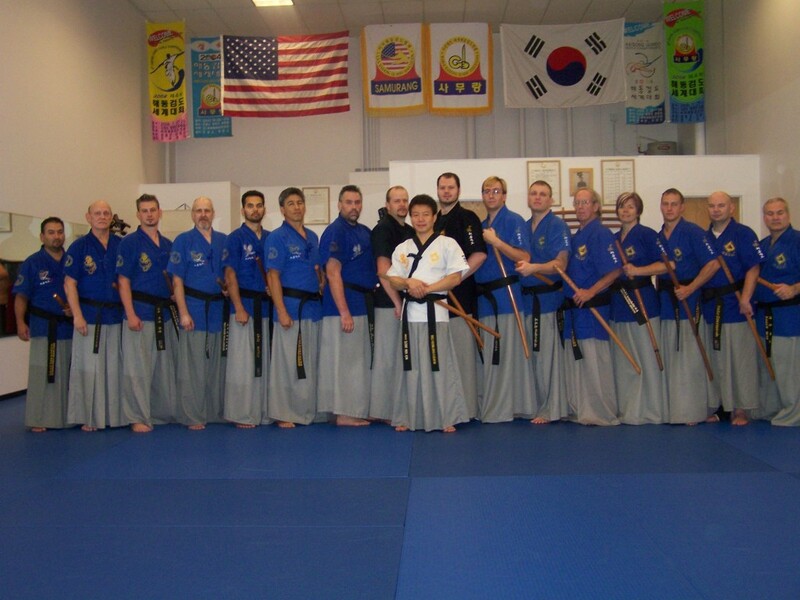 Haidong Gumdo is a separate belt program that has a different uniform from other Korean martial arts. The color belt uniform is a striking black with yellow logos that uses traditional style pants to give the illusion of floating while moving. There are 7 Gups, unlike the 10 Gups in Taekwondo, and a student progresses from white belt (Gup 7) to red/black (Gup 1) over a course of 12 – 18 months. All techniques executed are based on sword cuts and defenses. There are no punches, kicks, throws, or empty hand techniques of any kind. The material taught has a heavy emphasis on basic techniques and forms. A student is required to learn 8 forms, 8 basic/focus drills, 8 fighting drills and do 16 pushups to earn their 1st Dan Black belt. Students also work on cutting objects. For a student under purple belt, they use a wooden sword for all techniques. With this sword, they are able to cut paper. Purple belt to red/black belt students use a dull metal sword, and they are able to execute cuts on fruit or soft objects. Haidong Gumdo places an emphasis on being able to snuff out multiple lit candles as a way of showing proper technique and this is a requirement on several belt tests above green belt. For a black belt test, a student must be able to use a wooden sword to break a plank that is suspended by paper attached to two metal swords. As students progress to 1st Dan black belt, WHGF jingum (sharp sword) that is of pristine quality and workmanship is available. With these swords, students are able to cut bamboo poles, and straw mats. The World Haidong Gumdo Federation is a strong centrally controlled organization headquartered in Korea that controls the curriculum and belt testing internationally. At present, there are over 1,000 schools certified through the federation, and it is growing fast. The leader of the program is its founder, World Haidong Gumdo Federation President/Grand Master Kim, Jeong Ho. The curriculum is aggressively managed centrally and all schools world wide must adhere to the common techniques that are taught. Haidong Gumdo is much like Taekwondo in that respect, and less like Tang Soo Do or Hapkido where curriculum and organization are more loosely organized. This is an opportunity to help you grow as an instructor and to help grow your business. Many schools who offer Haidong Gumdo programs see their enrollments increase by over 30% in the first year alone. If offers an opportunity for parents of children to train together which leads to happier families and increased student retention. It also allows for your black belts in empty hand arts to try something new. Our industry finds that over 80% of 1st Dan black belts drop out. This gives your students a very new and exciting way to extend their martial arts training. Please, read the pages on this site and remember that you would be adding a program that is as much for your continued learning and growth as it is for the growth of your school. You will be able to progress more quickly due to your previous knowledge but you will still be responsible for ALL of the curriculum and testings. There are no shortcuts, books or videos. This is your training in the art. If you are still interested, contact Master Frankovich to request more information. A Martial Art is a journey, not a destination. This is a journey that will reinvigorate your interest in martial arts, allow you to learn new skills, and help grow your business. You will not be disappointed.